Dubai, UAE, September 09, 2018: With the summer nearly over, people in the UAE and across the region are back to their routine with a huge focus on health, fitness and fashion. With health bands becoming a trendy necessity, look no further than Huawei's TalkBand B5 that is set to become your essential accessory adding to your personal style statement. While big screens have already become an obvious trend with mainstream tech devices such as mobiles, TVs and computers, most smart wearable devices continue to have smaller display screens. 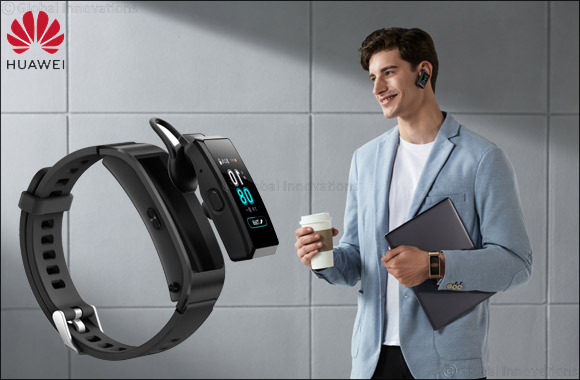 Based on Huawei's customer centric approach and its constant research to be on top of market needs, it's latest Huawei TalkBand 5 offers an innovative visual experience with a larger screen display unlike most wrist bands in the market. Whether you are an ardent gym goer or merely sportive by nature, the Huawei TalkBand B5's light and breathable straps will make you comfortable in sweaty and sticky conditions. This Sports version with the black silicon strap is made of high-quality soft silicone with breathable concave structure that fits perfectly at the back of the wrist. It's uber trendy perforated design helps sweat to evaporate during running or gym sessions keeping the wristband secure on the wrist. The stylish patterns at the front create a sleek and modern look. This probably is the one feature that sets the innovative Huawei TalkBand B5 apart from its competitors. The 2-in-1 design of wristband and Bluetooth headset are optimized for a better performance. Whether you want to answer or make a call, all you need to do is press the button to release the device, and it transforms into your Bluetooth headset right away. When you finish a call, gently push the headset back on the bracket, and voila, it's back to being your trendy arm candy.